Although I haven't been in Bee Vintage since the beginning, I've had a lot of fun with it. 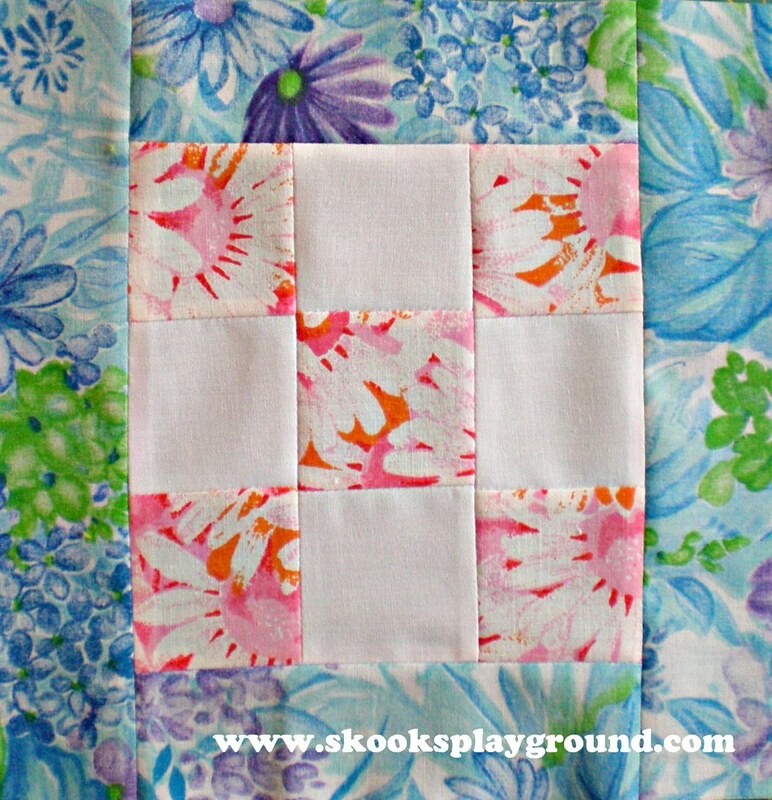 I've learned some new blocks . . . some more challenging than others. It was kind of sweet to discover that my last month (July - woohoo! I'm done early) was going to be a simple 9 patch variation. 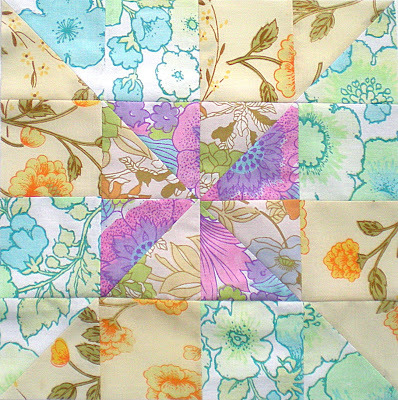 Tammie is looking to make the Sweet Menagerie Quilt that was posted up on Moda Bake Shop back in 2009. 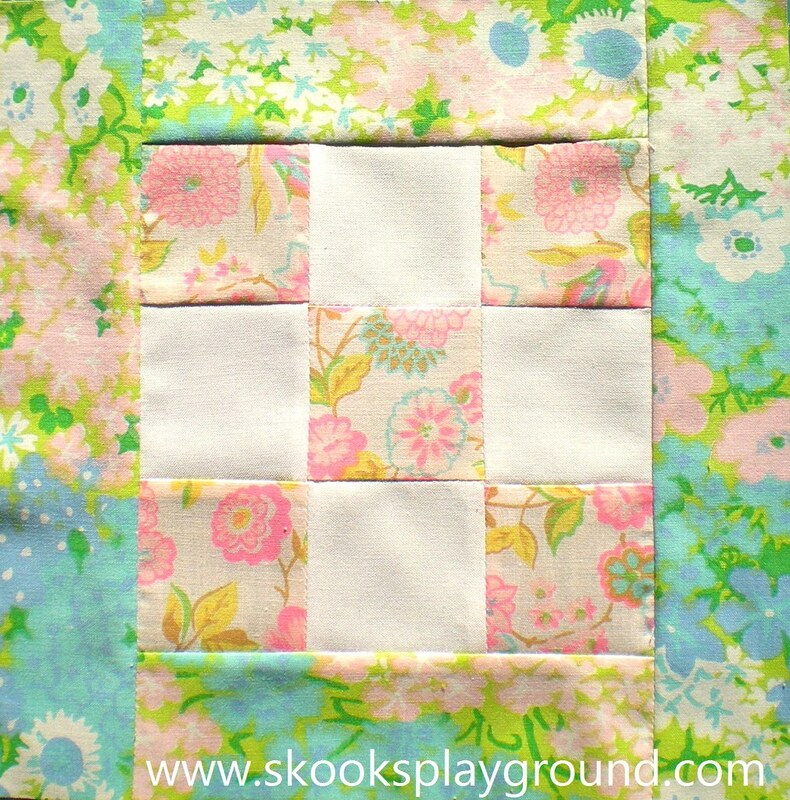 I think this is going to be a lovely quilt done in vintage sheets, and I'm really looking forward to seeing the finished product. And now . . . 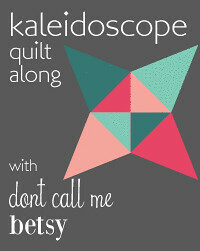 I'm just waiting on a few more blocks from my month, and I'll get to quiltin'! 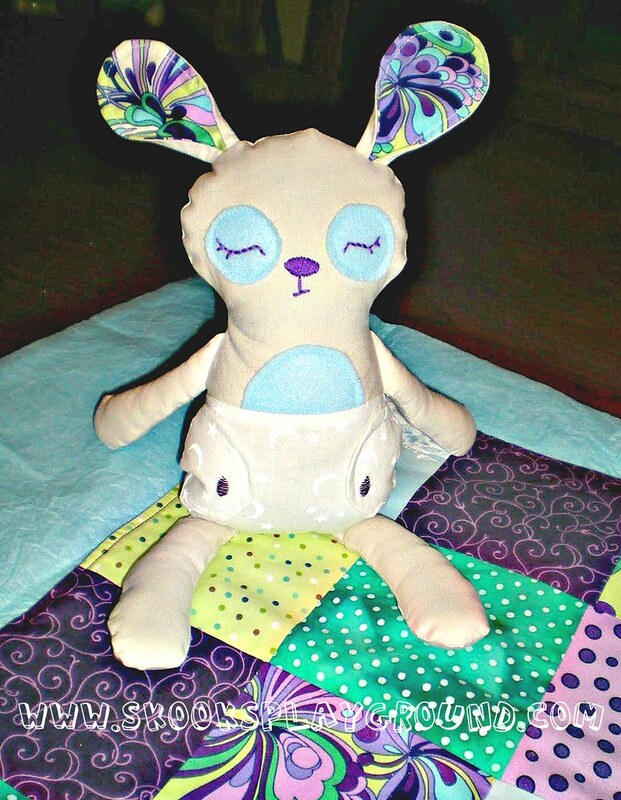 One of my most favorite bloggers and patternmakers - - seriously, she's the bomb - - Larissa from mmmcrafts, actually put one of my projects up on her blog! She's on my MUST READ list so there's no way I was going to miss this, but many thanks to Erika over at PinkSuedeShoe for alerting me to the feature right quick. 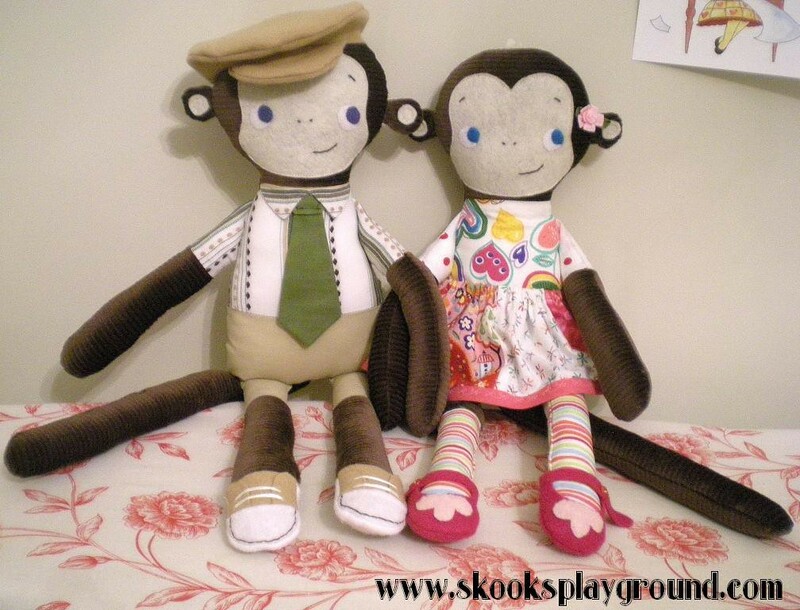 :) Remember these guys? She loved em! Photo Quality = Terrible. Bunny = Cute! If that just wasn't enough to get me grinning from ear to ear, today my sewing room is being featured over on the Crafty Storage blog! Having gotten so much inspiration for my room directly from the awesome spaces featured on that blog, I have to say I'm quite honored to now be among them. :) Thanks so much, Paula! 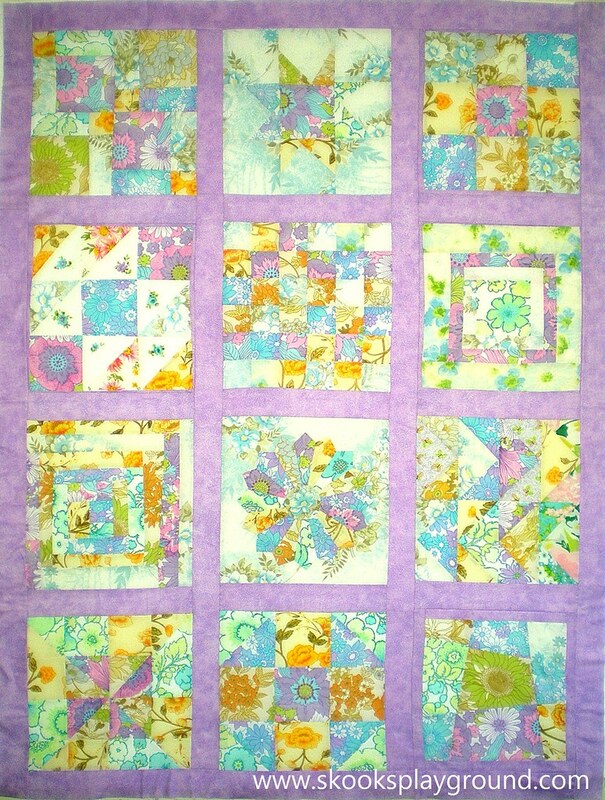 Well, I put it off until the*last weekend* possible, but I finished up June's block for Bee Vintage. 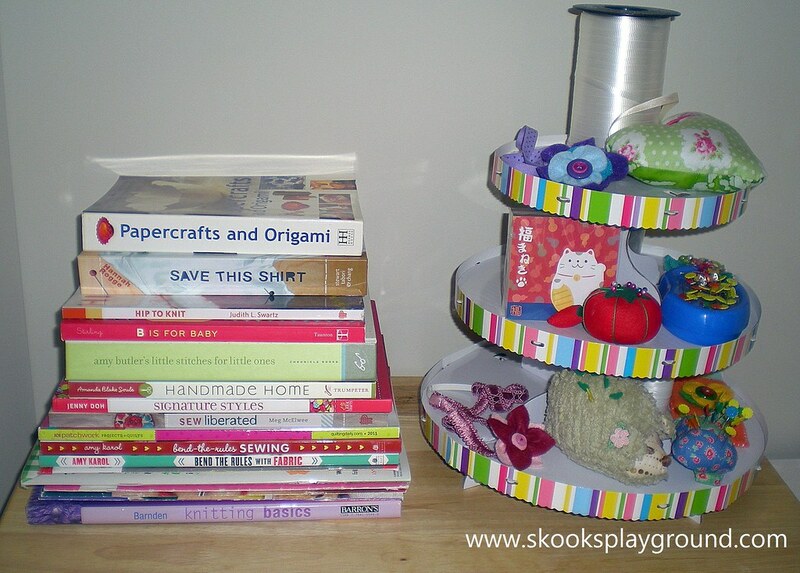 Jenny asked for stacks: "stacked coins, stacks of books, stacks of anything!" I didn't know what to do so I asked Pedro. And you know what he said, right? "Build her a cake or something." It may not be her birthday, but who doesn't like cake? 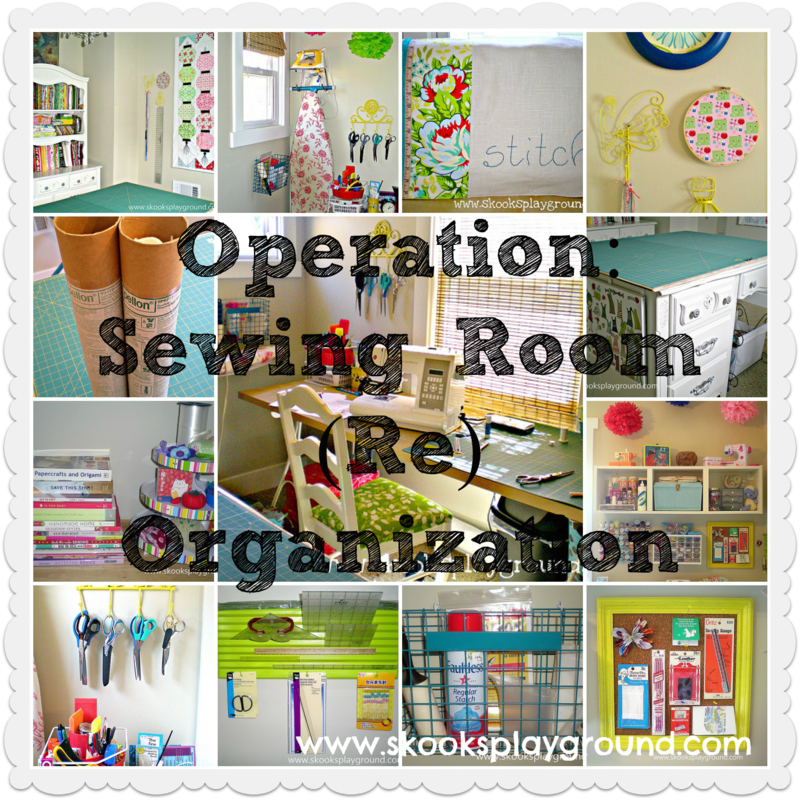 For the last month I've really been going to town working on cleaning up my sewing room. 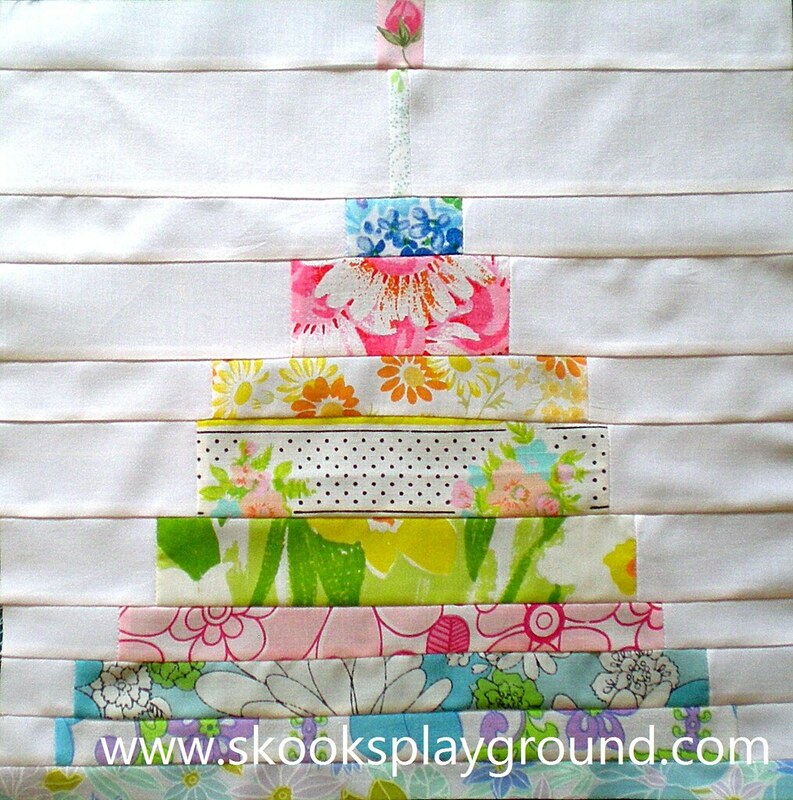 It all started with the fabric rolling, then I jumped on the ribbons, and from there it just snowballed. It was driving me crazy working in there because though it seemed to be organized to the untrained eye, there were still supplies unpacked from our move lurking in boxes, drawers shoved with bits and bobs, and frankly . . . I just wasn't able to put my hands on my stuff when I needed it. But some things were just annoying and a bit frustrating. There is no closet in the room, which may be a blessing in disguise because if there were it would be tempting to just shove stuff in there. 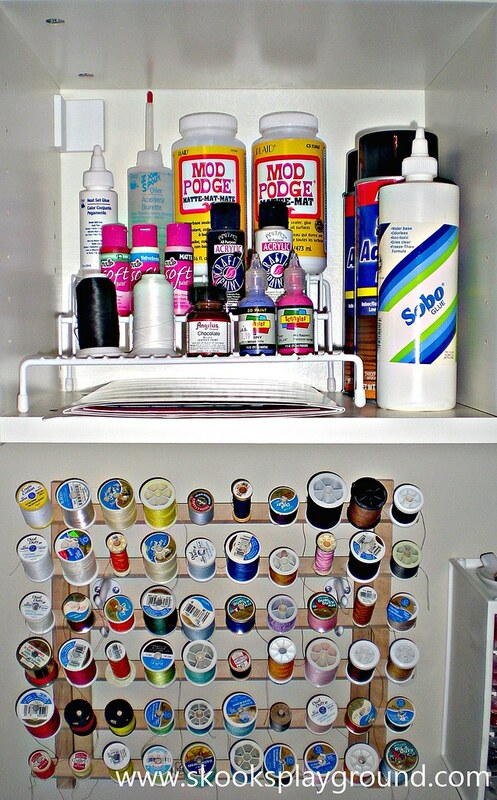 But without a closet, everything has to function and foster creativity at the same time . . . too much clutter *out* in the open doesn't make me a happy crafter. I realize that some creative people thrive in that kind of environment, but it just doesn't work for me. Those lovely organized ribbon cards got relocated into a larger storage container (or rather, 2 larger containers) when I discovered a bunch of ribbon later in the process of cleaning. Oh well . . . it was cute while it lasted. A new Salvation Army thrift store opened up really close to my house and they had skads of lovely sheets just waiting to be adopted. I brought home a bunch and they ended up getting shoved underneath the wire bin that's holding all the vintage sheet fat quarters. Then there were the regular fat quarters and the Kona fat quarters and the somewhat impressive stash of charm squares that I've acquired through various trades over the years. Anyway . . . it all got shoved in here. 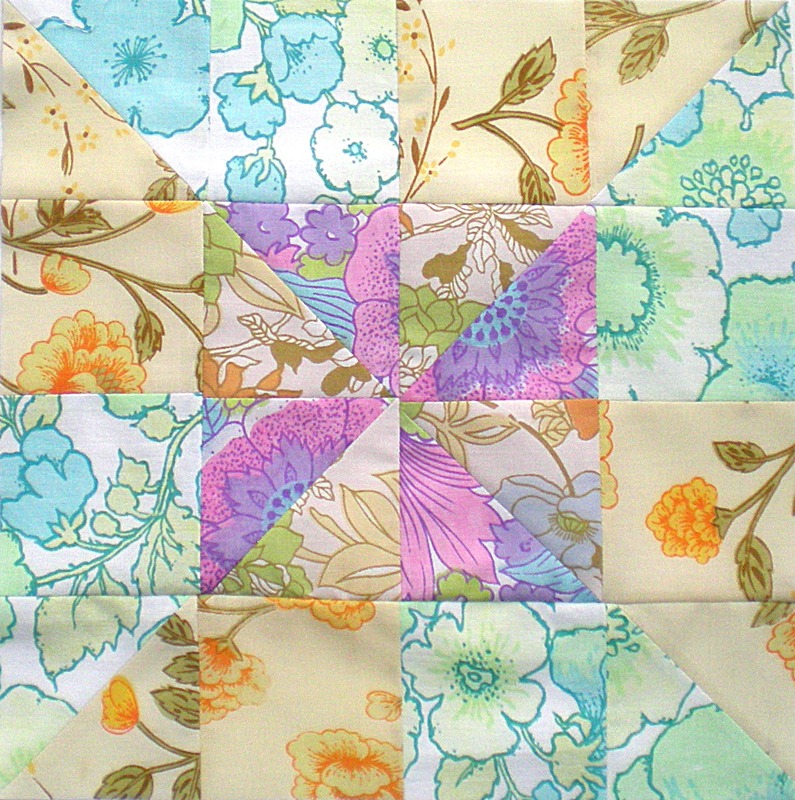 A picture I took of things before I got all shove-y with the fabrics. Here's a corner I've never shared before with you. This cabinet is located right behind the door. The hat rack hanging above it came from Ikea (LOGGA for anyone interested). This was my partial solution to not having a closet in the room. 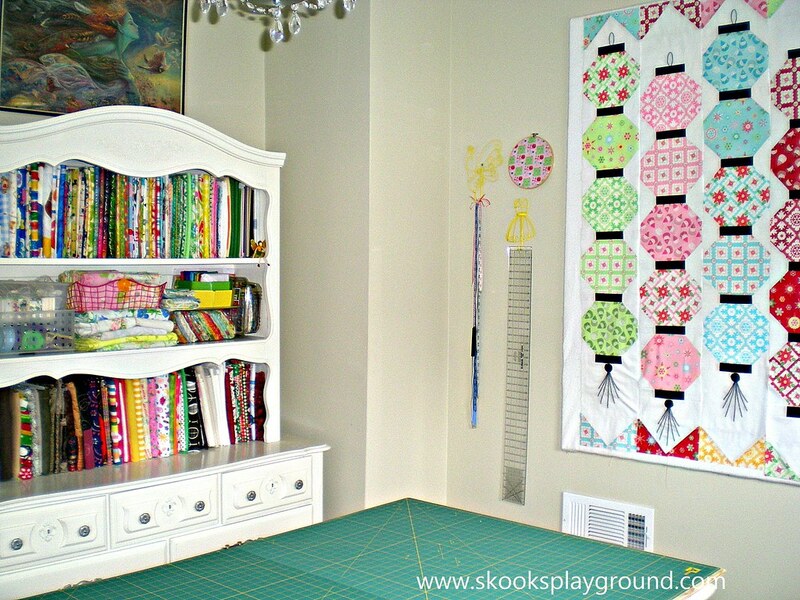 I knew I wanted at least one rack in the room so that I could hang larger pattern pieces grouped together. 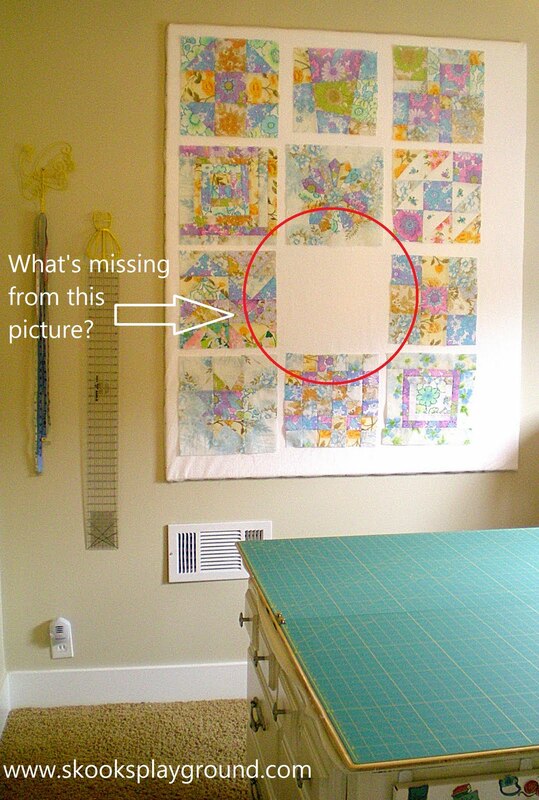 It's also housing magazine files of different types of patterns. I still have to make some labels so that I know what kinds are in which boxes without having to pull out every single one every time I need to find a pattern. 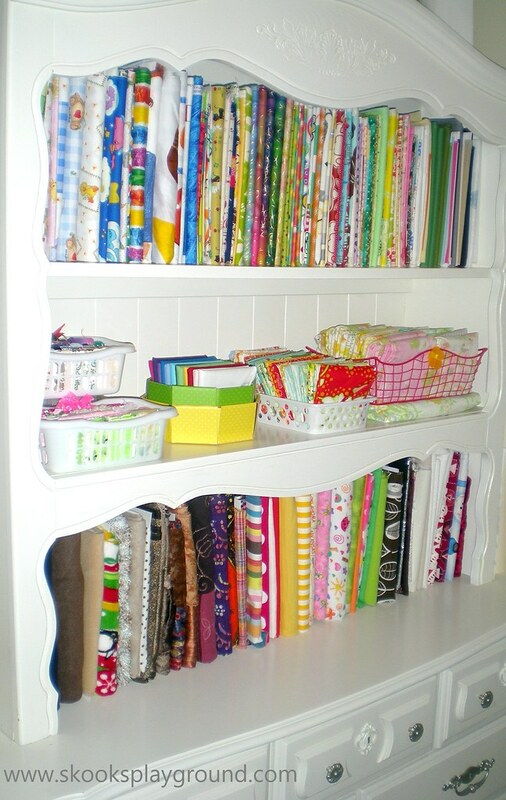 On top of that cabinet I've got my stack of sewing/crafting books. Towards the bottom are a lot more knitting books, and as you get closer to the top the sewing stuff dominates. I'm not much of a paper crafter, but I do have one of those kinds of books as well. To the right of the book stack I've got my sewing sweets . . . I repurposed a cupcake stand that we used for Little Miss' birthday party to hold pincushions and other random small items. Here's what's going on inside that cabinet. (I didn't take a picture of the inside of the drawer, but it holds scrapbook paper and the like.) 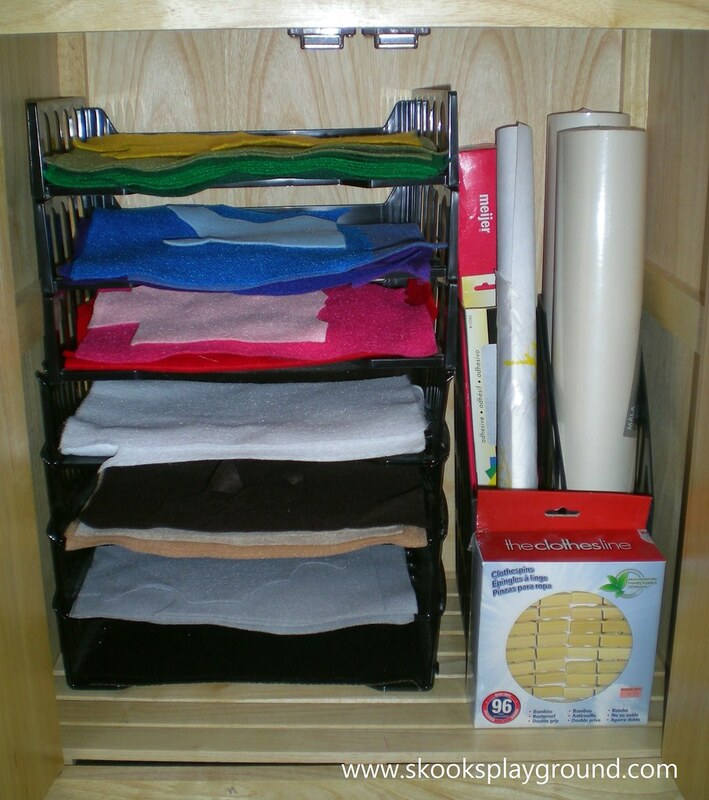 I used to have these file trays in the hutch holding all the felt sheets, but the more I rolled the fabric the more room I needed so these got moved here. 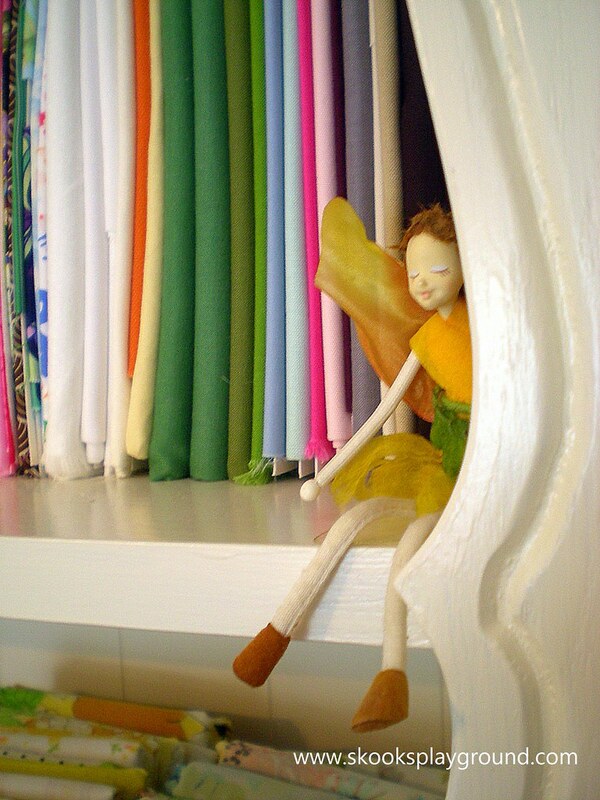 Next to that I've got a couple rolls of paper that I use for pattern pieces, some freezer paper, some leftover magnetic sheeting from my paper doll project and some clothespins waiting to be made over and used wherever they are needed (in the playroom to hold artwork, to clip papers together, whatever). Here you can see the heavy duty shelf I had Mr. Skooks move for me (BILLY from Ikea). 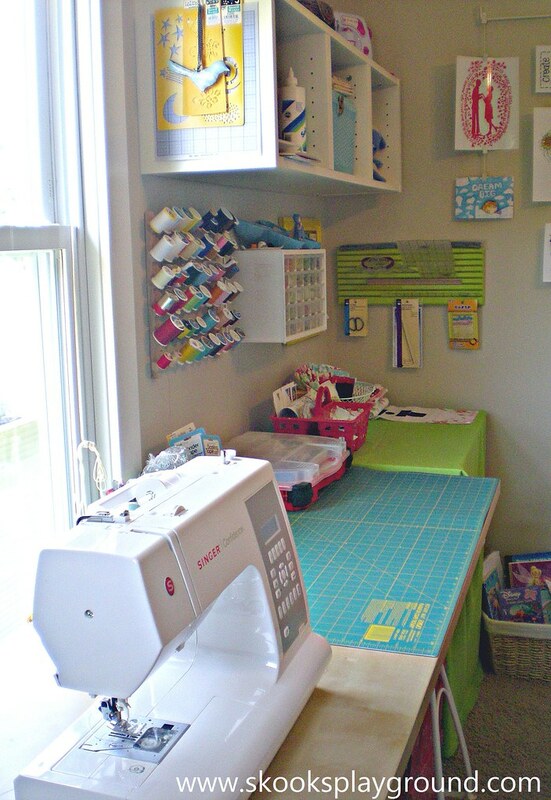 I so very much wanted to sew in front of the window and on a whim moved the entire sewing table over there, which necessitated the shelf moving as well. 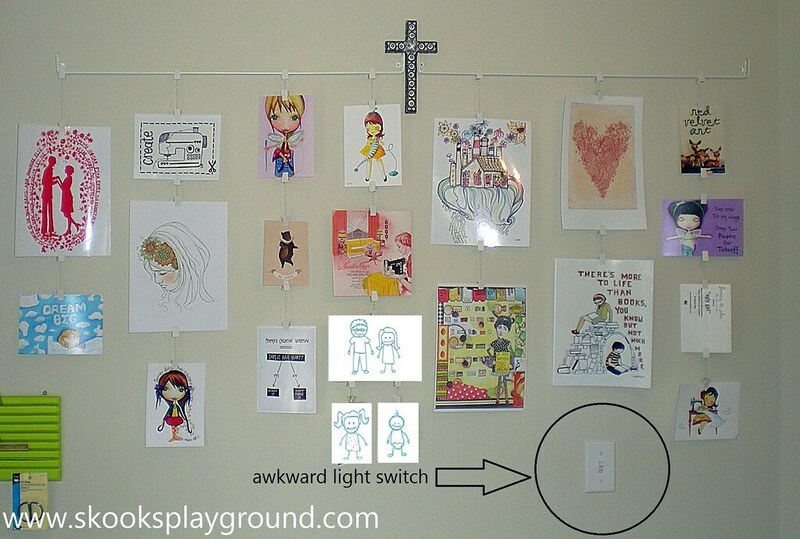 (I explained all that malarky back here when I talked about the design wall.) So, yes . . . there is A LOT going on here, but it all makes sense. 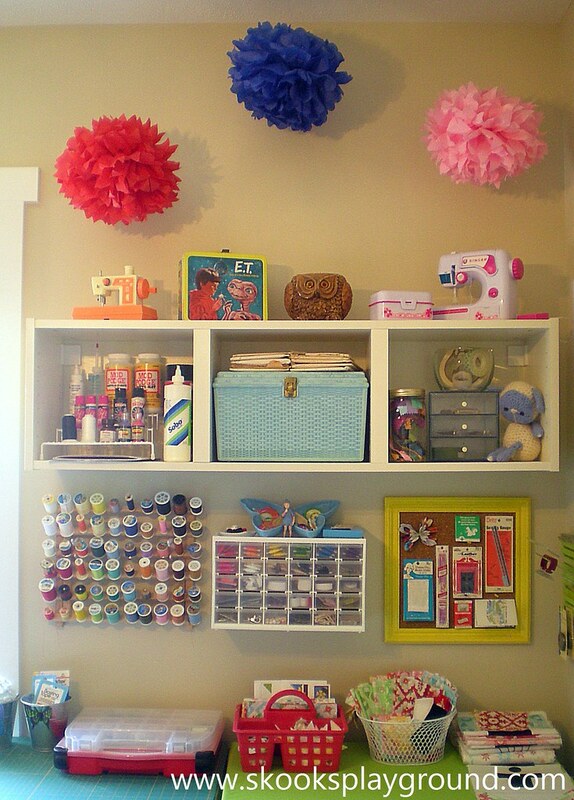 The tissue paper poms up above are left over from Valentine's Day and Little Miss' birthday. I left them up for a LONG time over the dining room table because they are so fun and cheery, but eventually they needed to be taken down. 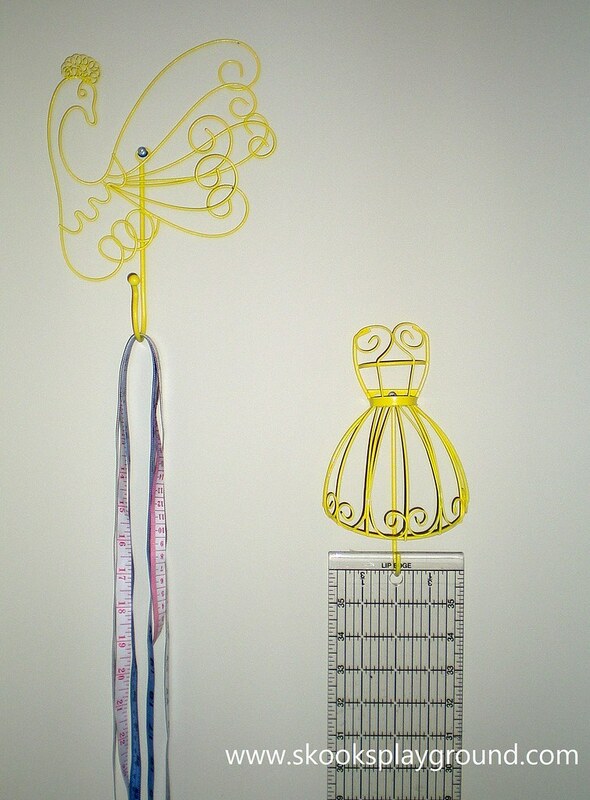 Rather than put them in a bag in storage til the next fiesta, I decided to hang them up in here. 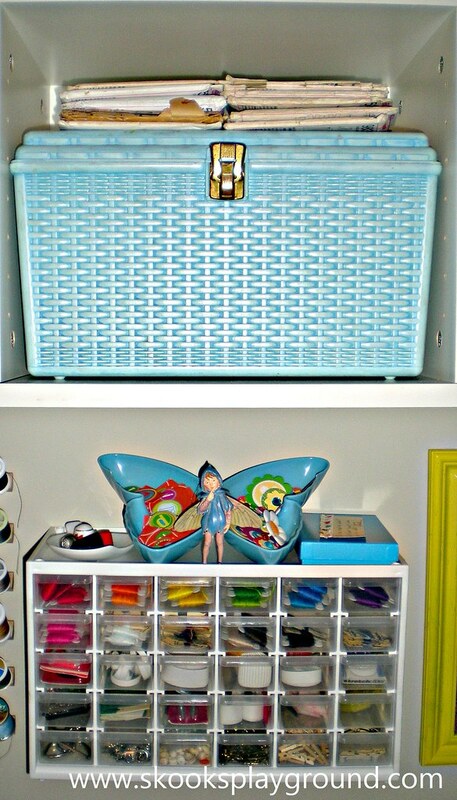 The toy sewing machines and my beloved ET lunch box got moved to the top of the shelving unit. As I was going through stuff I also found my mom's owl. 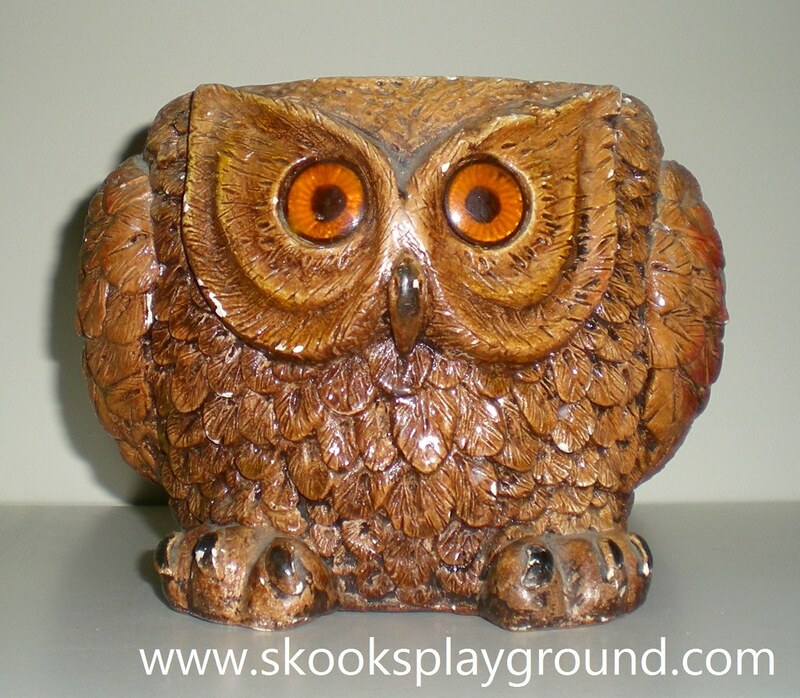 I'm pretty sure at one time it was a plant holder, but all my life I knew it as THE OWL and it lived on my mom's desk in the kitchen . . . providing some desktop storage of all the pens, pencils, and scissors we used on a regular basis. At some point my mom decided she was over it (maybe 20 years into its use), and I pounced on it. It's not even like I was "into" owls or something, it was just THE OWL. How could it just be thrown away?! This thing was an institution in our kitchen my whole life. (Yes, I said it. The owl was AN INSTITUTION.) I can't explain what the thing is . . . but it must live on. Let me break down the cubbies. In Cubby #2 we've got my mom's old sewing box. That little stack on top are some super sweet vintage sewing patterns I found while thrifting the other day. I'll show you those some other time . . . I've got a project in mind for them. 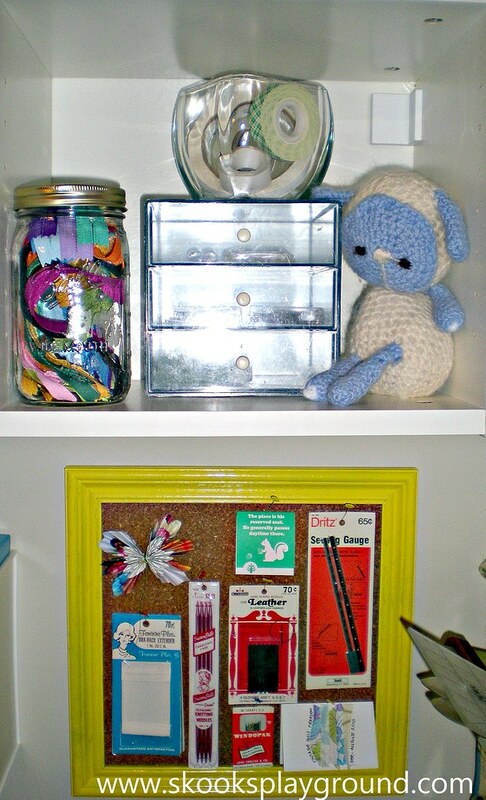 :) Underneath Mr. Skooks hung this dandy little supply cabinet (an ArtBin Store-In-Drawer Cabinet) . I sorted all my embroidery floss by color and also was able to compartmentalize elastics, needles, pins, beads, velcro, and purse findings. What is it about tiny drawers? I love them. Especially because this thing has been sitting around empty for ages, and now it's full-on in the function department. Yes, "full-on" like a Double Rainbow. Let me 'splain. As I was sorting through my mom's old sewing basket and getting all the stuffs housed in the tiny drawers, I came across a small stash of vintage sewing stuffs . . . some of which were never even opened. 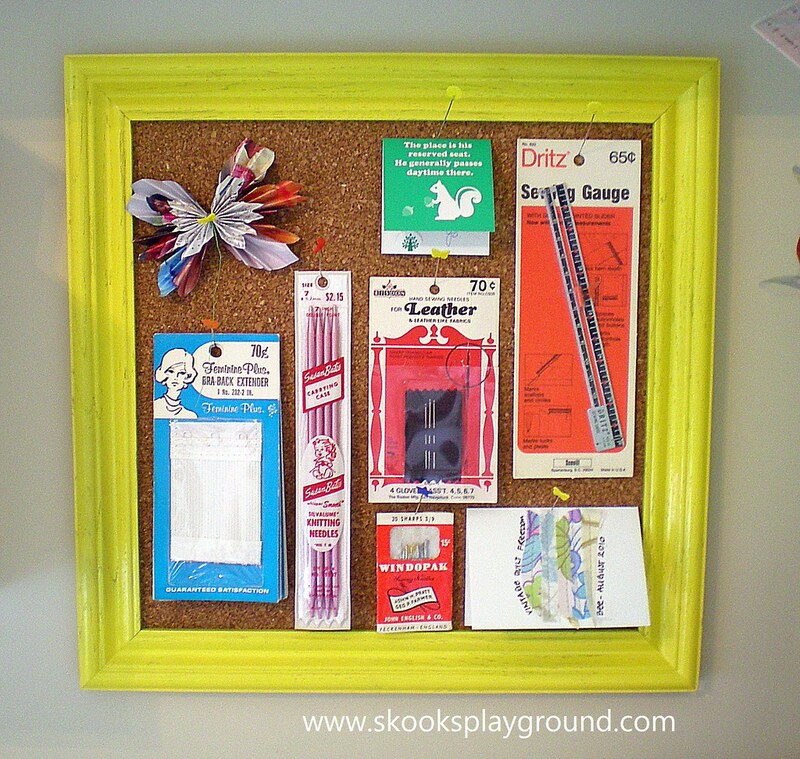 I decided to "frame" them using this corkboard I found at the thrift store (Mr. Skooks spray painted it for me). I also threw in there my paper flower gift bow (the product of my first and most viral tutorial), a funny little notecard I got from Jo back when I ordered some fabric from her, and a little card one of my Vintage Sheet Freedom Bee members made for me (can't remember off the top of my head . . . should check!) That pack of bra back extenders kind of kills me every time I look at it. Awesome. Another formerly black file organizer sprayed to be less dull is now housing my work binders and notes on my projects. Under each leg of the sewing table I have 2 boxes (LINGO from Ikea) holding projects in process. I try very hard not to start projects I don't have an empty box for so that the UFOs don't get out of control in here. 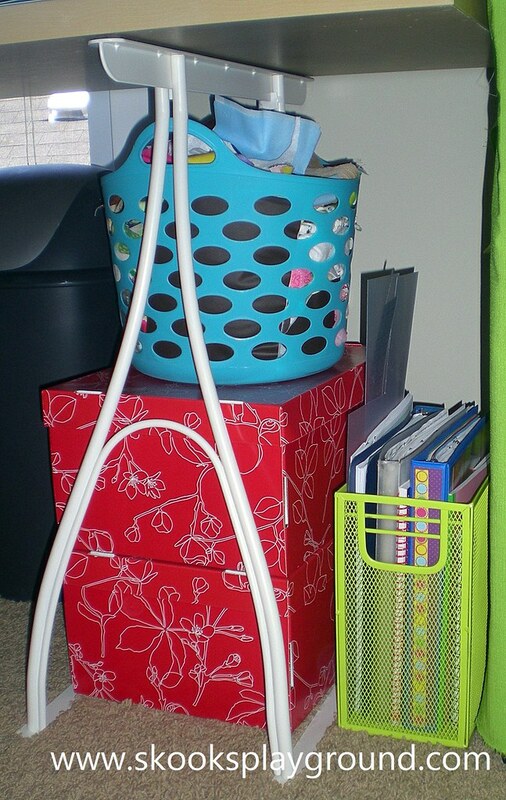 On top of the boxes I've got these little baskets (Target dollar spot) which are holding fabric scraps. 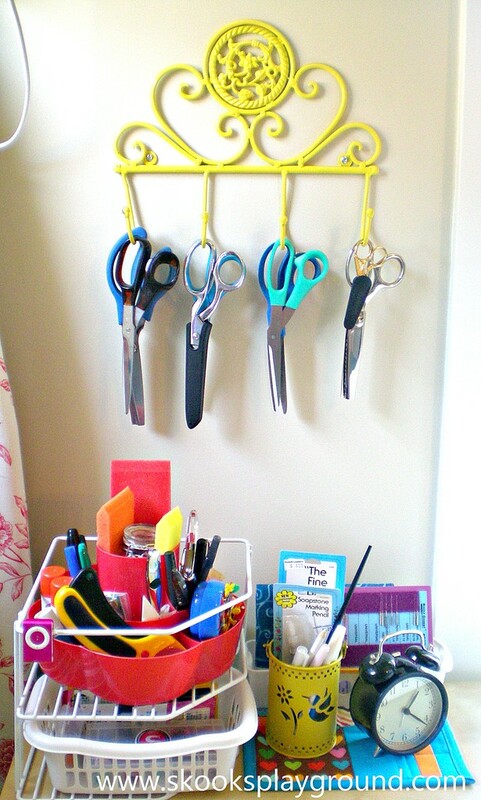 I found that rack at the Hob-Lob in the Home Accent Clearance section for $2 and decided to use it to hold my somewhat ridiculously large scissor collection. And yes, it has been spray painted (it used to be this fakey kind of antiqued rust color - blech). The wire rack on the left used to be in my kitchen in the old house organizing plates and things in the cupboard. We don't need to use it that way in this house, so I decided to throw it in here. Not my favorite look, but it created a 2 tier storage situation which allows me to have my little spinny rack of stuff (I think I got that thing from the dollar spot at Target awhile back) on top and a few bins (recognize those?) underneath. 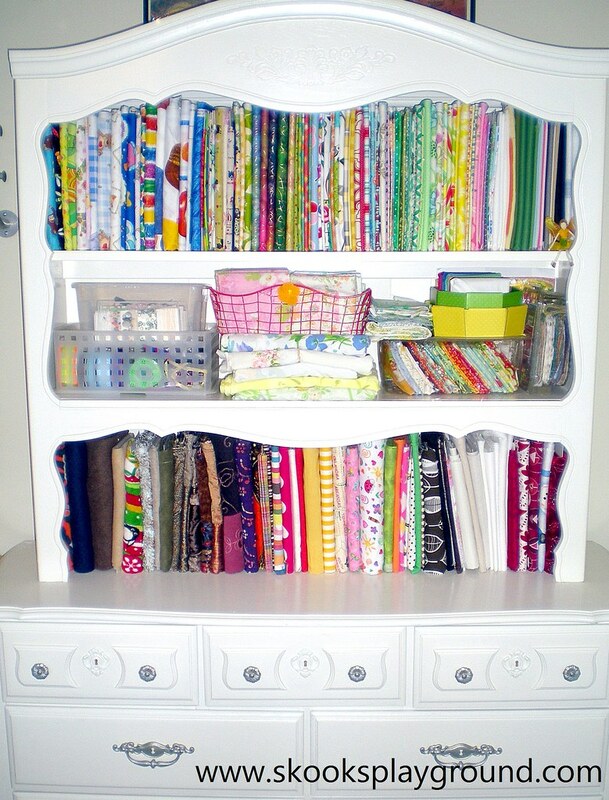 That bin closest to the front has all of my bobbins and the one in the back has empty thread spools which I will somehow find a use for (currently they make an appearance on the rare times I dare to sew with Kee-ku underfoot. He likes to use them to make tall stacks and then KNOCKS 'EM DOWN). I found a drawer organizer that wasn't being used, and it's behind the yellow cup holding my Needle Grabbit and some extra needles still in packages. The yellow cup has all my different fabric marking pens and chalks and I stole the alarm clock from our bedroom because I'm constantly losing track of time in here. Also because its alarm could WAKE THE DEAD so we are using something else in the bedroom. :) I've got plans to put a wall clock in here, but this works for now. 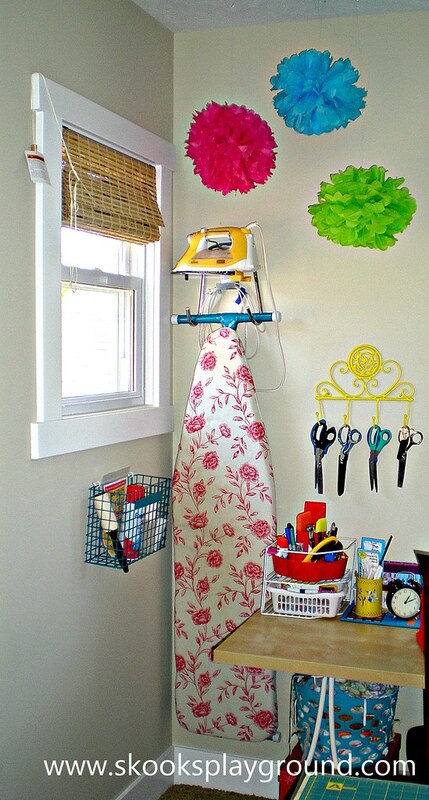 I had Mr. Skooks take the ironing board holder off the back of the door and screw it into the wall. 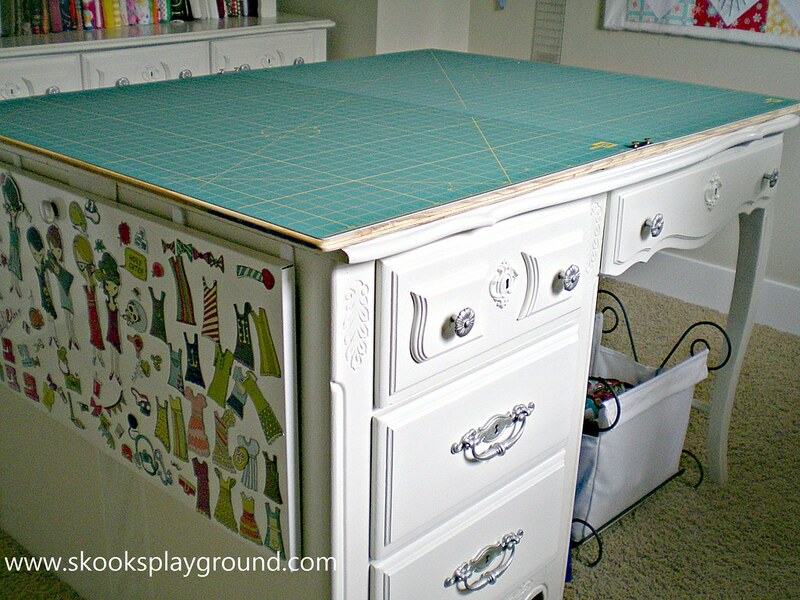 This corner is where I use the board the most, and I like to be able to hang up my iron (at least) at the end of the night so it doesn't settle a groove onto my ironing board. I need to recover it sometime (it doesn't look as bad from far away as it does up close), but you can see that the ironing board itself didn't escape some spray paint action. That deep turquoise shade was used to perk up the wire basket on the wall too (it used to be black) . . . This used to be an over-the-cubicle-wall wire rack that I inherited from a friend who was dejunking her house. 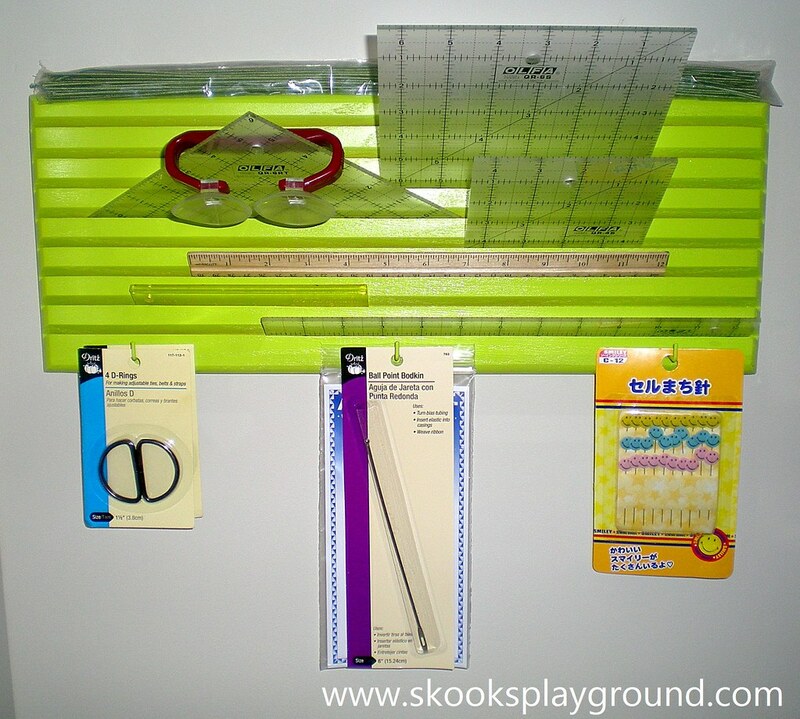 Mr. Skooks sawed the over-the-wall part off of it and screwed it into the wall for me so that I would have all my iron-y stuffs at the ready when my board is unfolded. It's dandy. 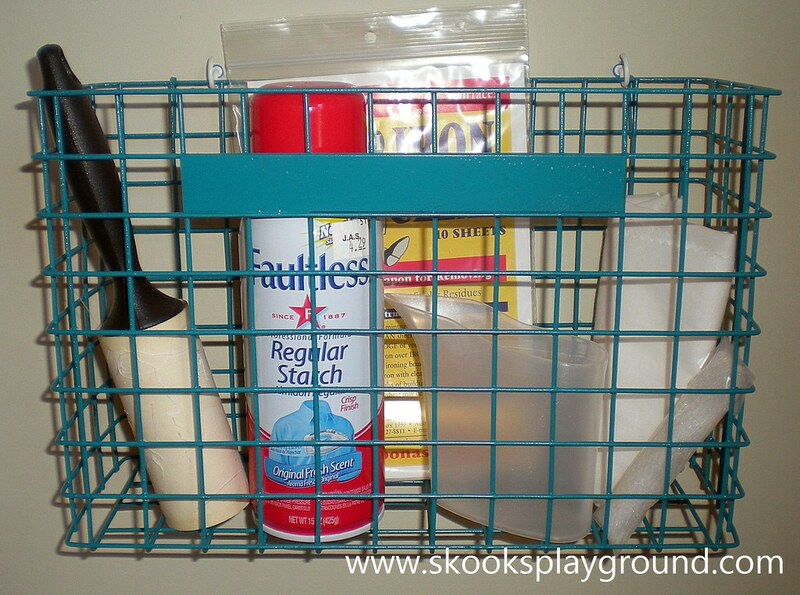 I use it to hold my spray starch, lint roller, water cup for the iron, some iron cleaning cloths, and my pressing cloth. I hung the paper dollies on the side of the table (after somewhat lame-ly taping that strip of fabric to the hole left between the 2 pieces in order to accommodate the cutting mat) with some Command hooks. 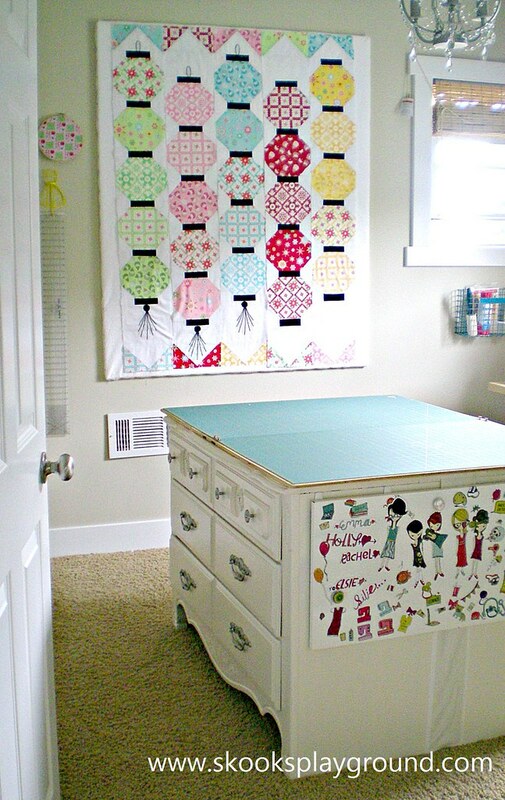 From the paper doll magnet board over to the wall is Little Miss' domain. 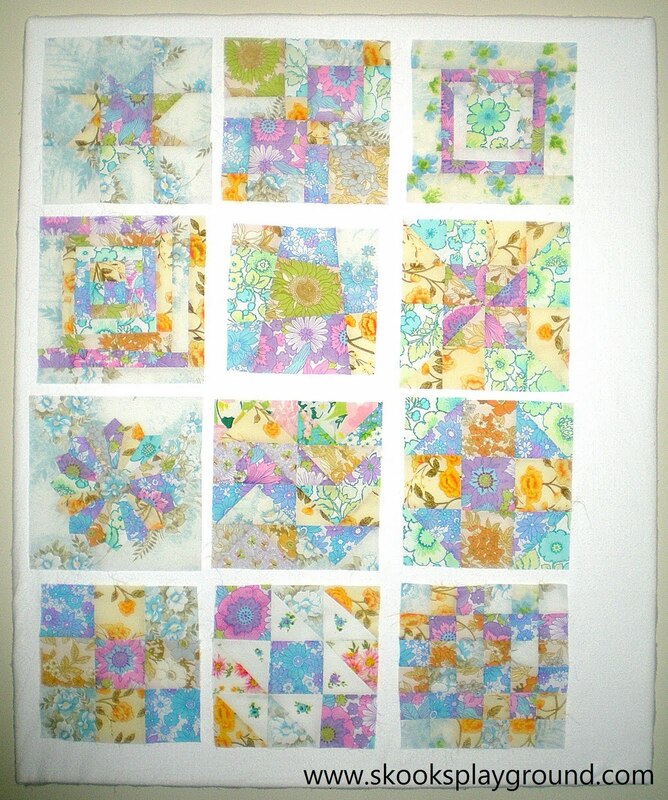 :) As you can see, my next project is working on finishing up that Glow Happy quilt for Christmas. WHEW! 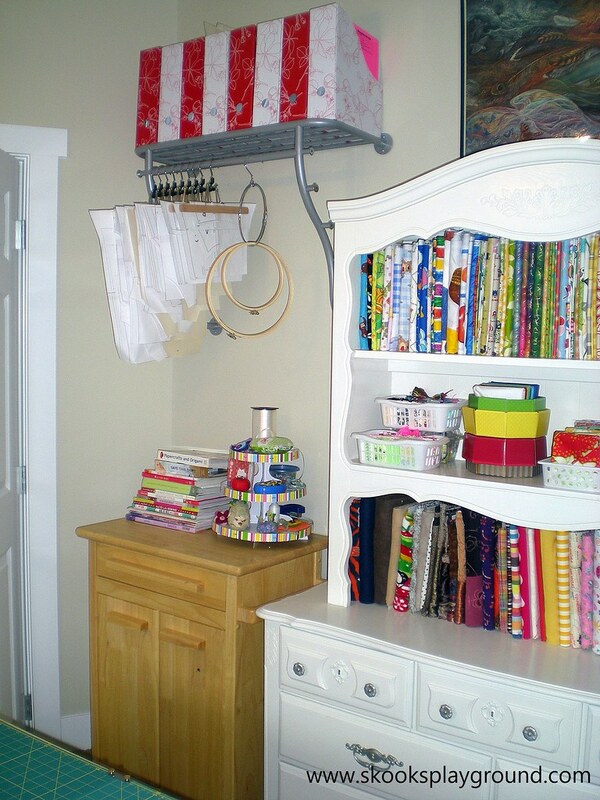 I hope you enjoyed my little sewing room tour. Now that it's so clean, I'm inspired to go mess it up. 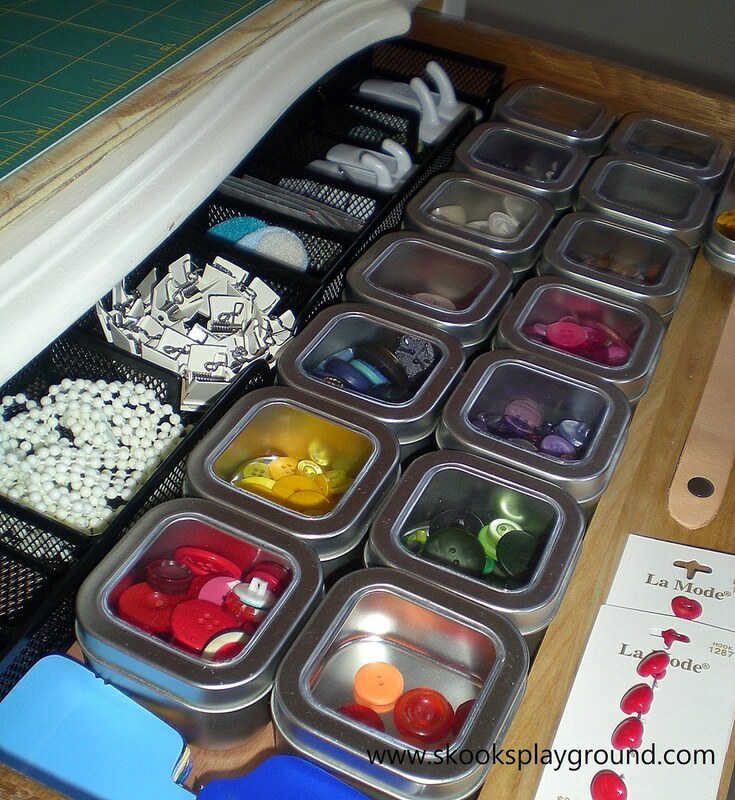 What are you making today? Just thought I'd toss this info out there for anyone that might be interested. 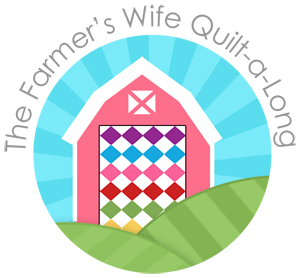 I've been seeing a bunch of fun activities popping up all over the place, and it occurs to me that some of my more quilt-inclined readers might be interested. 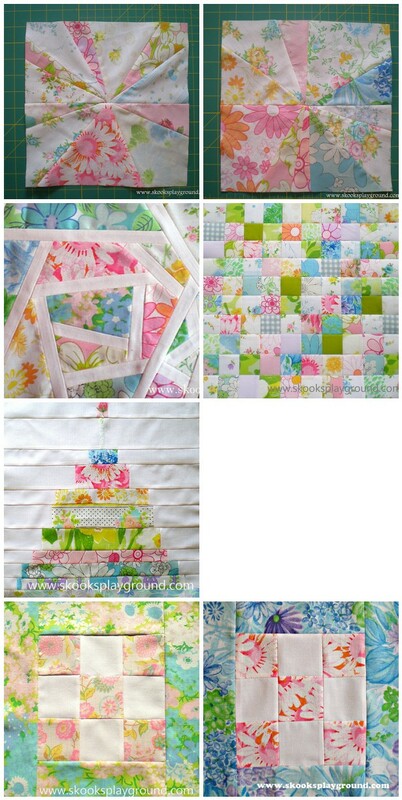 The Farmer's Wife Quilt Along: This is a biggie . . . last I checked this one had 400 people signed up! This one is not a quilt along, but more of an invite to finish up some WIPs (UFOs, whatever) or stash bust some quilts for kids in need. This is a great idea . . . and I'm sure we all have fabric and a bit of time we can devote to the cause. 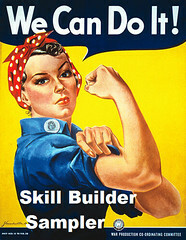 Don't forget about the Skill Builder Sampler! Any others I should know about?! One of my favorite bloggers, Ellen from The Long Thread has a book coming out! 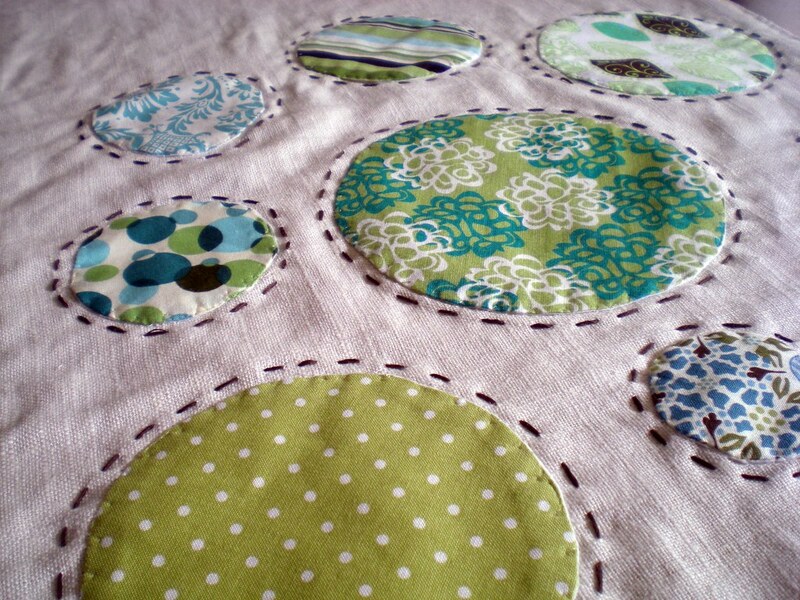 It's called 1, 2, 3 Sew.